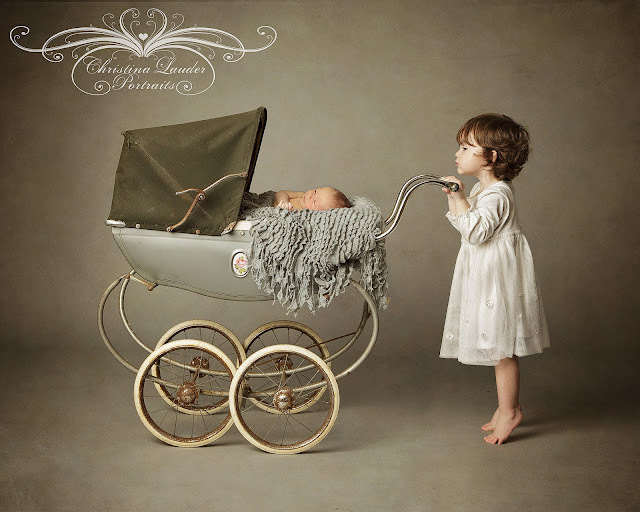 At first the thought of working with a very young child and their newborn sibling scared me. Its hard enough working with either on their own let alone trying to get them to co-operate together. How would this even be possible? A 16 month old little girl can't come close to holding their baby brother. So I had to get creative and think of a way to get the 2 together both safely and beautifully. Well I think I did it. I have to admit though, the above is actually 2 separate images. This little girl was a bit too young to understand how careful with the pram she would need to be so rather than take any chances I first photographed big sister with just the pram on its own and then followed with baby brother on his own while dad looked after big sister. Then I worked my magic in Photoshop to put the 2 together. This is a common occurrence when photographing young babies. Its always better to be safe than sorry and I'm quite thankful I have the tools and skills to do such things. What makes this image even more special is that there is continuity between this portrait of the sibling group and the newborn portraits that big sister had of her own a year and a half ago. 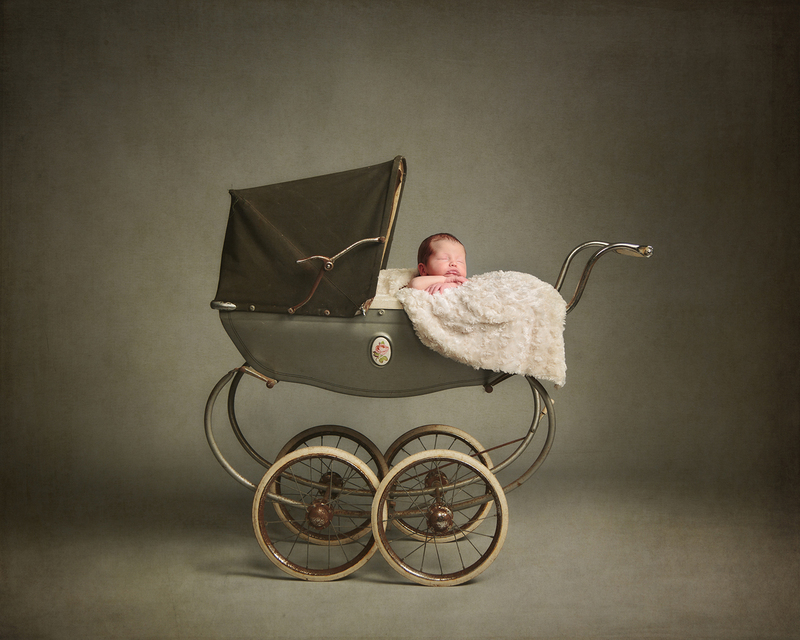 They both included my favourite pram. And now this image shows just how much this little girl has grown since her session. 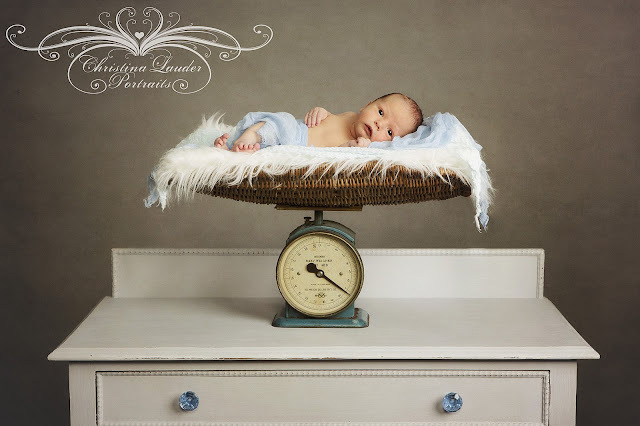 I always love including the baby weighing scales too. I love the look and I like that the weight is pretty accurate so it tells something about baby as well. This time I used a new set of drawers that I recently painted. I love collecting furniture and this is something for which I am always on the look out. And of course I was able to provide some of the more simple details shots that are so wonderful to look back on in time. They grow so fast and these cute tiny little hands and feet won't be tiny for long. I think they work perfectly in a collection of images such as the one below. Once again, it is so nice to see past clients return. I love knowing that they valued my work enough to want to do it all over again and at the same time I get to see how these beautiful little babies have grown. If you are expecting a child and interested in having one of these sessions please don't leave it too late to get in touch. The ideal time for portraits such as these is when baby is less than 2 weeks old and you'll want to make sure we have the space to accommodate you when the time comes so its best to get in touch before baby is born. To get in touch please contact me via my website here or give me a call on 01455 611069.